I’ve taken 6,386 photographs with my DSLR this year—short ~250 that were deleted immediately on account of poor quality—and easily my lowest total since I began shooting January 1, 2012. For some perspective, I took well over 25,000 pictures that first year but don’t let the lower total fool you; I’ve no doubt become more selective in my shooting—ditching spray and pray tactics in favor of a more established process. Thanks to the experience I’ve gained over the past three years, 2014 represents my best year as a photographer. I launched this website in a rare spat of motivation on January 18, 2014, and I’ve processed and posted 136 photographs (and counting at the time of this posting) since. I thought I’d share with you my personal favorites from throughout the year. Two things stand out from last winter once dates flipped to the January side of the calendar: 1) Polar Vortex cold, and 2) the great sunsets it wrought. 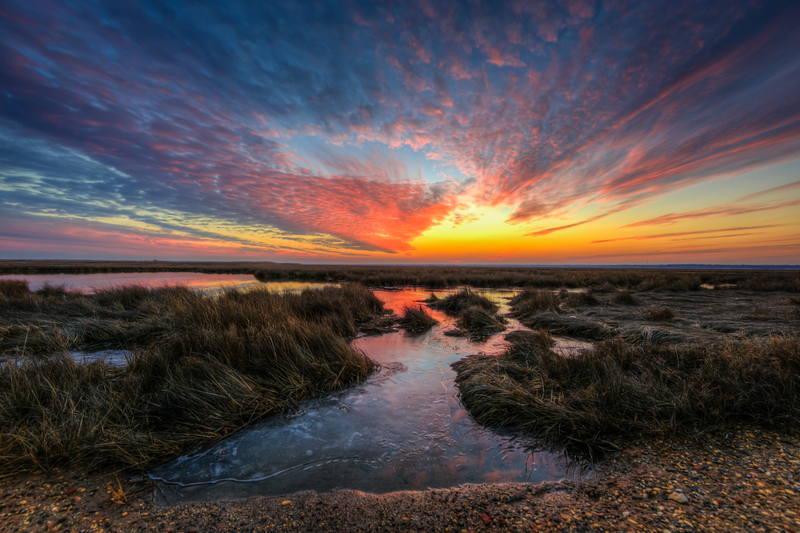 As a sunset landscape photographer early 2014 brought the goods to the New Jersey coast, rendering multiple standout sunsets each week. This reality will be reflected over the next few shots in the series, but this particular photograph stands out for me as my favorite sunset shot I’ve been lucky enough to make—not just this year but ever. 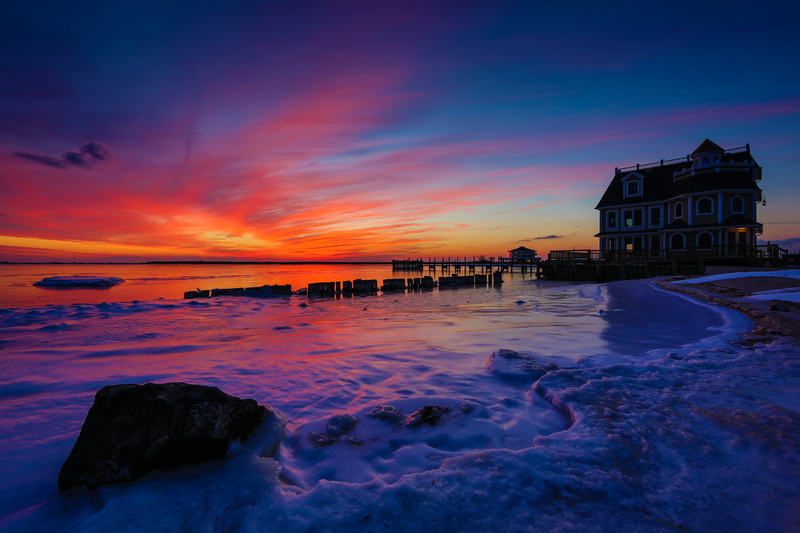 What really makes it a standout for me is the coupling of the frozen bay and the lines it creates with the deep purple and scarlet red sky that I covet so much. The marching clouds moving steadfast out of the southern vanishing point splay out in almost winged fashion as they moves off screen to the top left. There’s just so much sweetness happening right here. 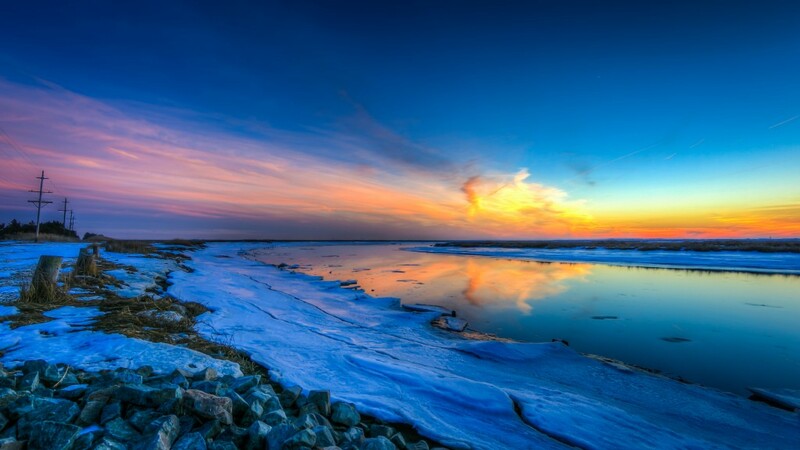 When rich pastels, a smattering of snow pack, and water still as glass come together you have all the ingredients of a great sunset photo opportunity. All you’ve got to do is compose it, breathe, and fire. With this shot, aside from the great colors, I like the way the pink clouds racing across the horizon to the left are counterbalanced by the angle of the water moving off screen to the bottom right. It brings the right kind of movement and balance to the photograph that makes it a standout for me. This title is lyrically inspired. Having been one of the coldest winters I can remember I was listening to Led Zeppelin’s “Babe I’m Gonna Leave You” and the line “I’ll leave you when the summertime” just stuck with me. More cold, more great sunsets. Here’s another shot from Dock Road, taken about 1/4 quarter mile west of Winter has its ways above. To make this photograph I set my tripod about 18 inches off the ground, set back about two feet from where that small tidal pool spills out onto the pebbles in the foreground. That opening is only about two feet wide. That’s where the magic of the 14mm wide angle comes into play, making the whole scene larger than life as it pushes everything back toward the vanishing point; in this case driving all eye movement to just right of center along the horizon. Hey, alright! The first photograph in the not sunset division. I love black and white. Growing up as a wannabe photorealist pencil drawer I did just about everything in black and white. Resorting to other mediums only as mandated by the art teacher. And while color has grown on me in surprising ways, black and white will always hold a special place. Specific to this low key black and white landscape I was going for a moody, dead-zone February vibe. Coupled with this lazy shutter trick I sometimes try where at slightly sluggish speeds—1/15 of a second in this case—I pan the camera across the horizon, holding the camera steady turning only at the hips from left to right. Executed correctly—which is equal parts luck, voodoo, and skill—it can create a really cool ethereal effect. 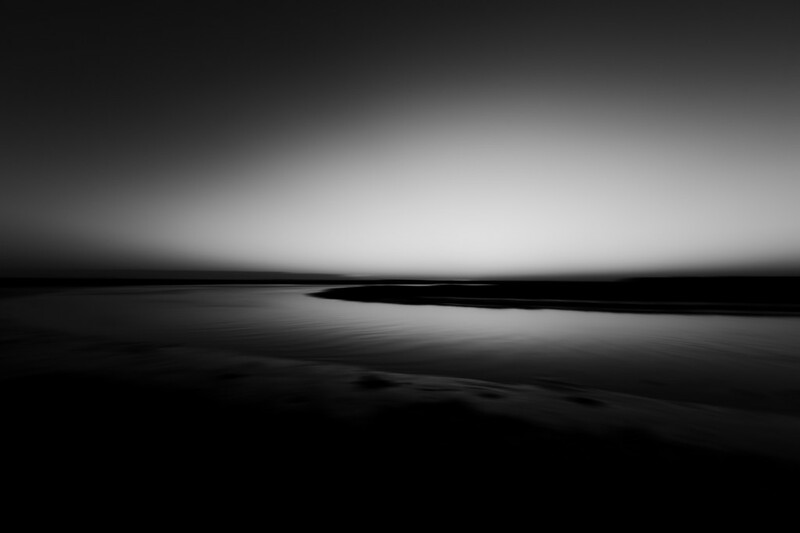 With this shot, the soft undulating water ripples move me peacefully through the photo despite its apparent darkness. I am not a morning person. That means I miss just about all the sunrises. This is probably a fail on my part considering I have the whole of the Atlantic Ocean like 6 miles to my east. Lucky for me on February 22nd I was awake. I can’t remember what made that morning different from any other in terms of waking up early, but hey, it paid off. 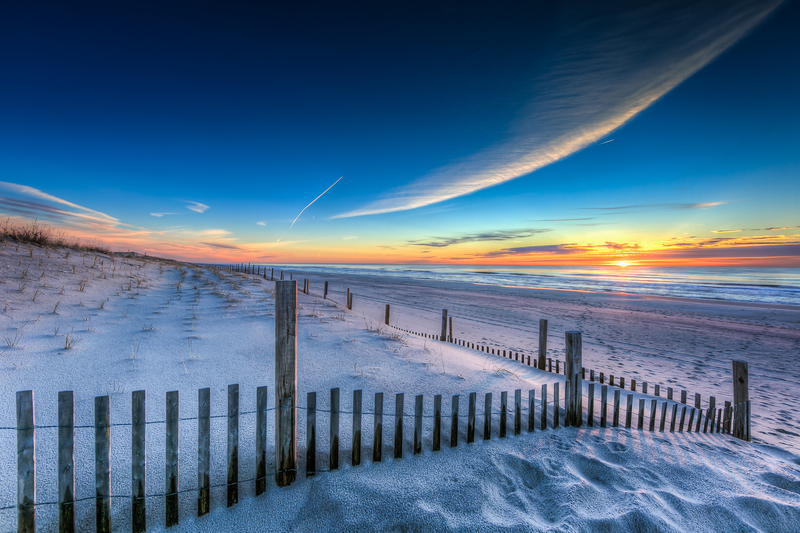 When I was composing this shot I wanted to capitalize on two key features: 1) the dune fence arcing from left to right, and 2) the sweeping cloud diving in from the top right corner that eerily reminds me of one enormous looming moon. The curving trajectories of these two features play so nicely together, achieving the balance I seek with my work. Of course this is all enhanced as its backlit by gorgeous sunrise light. More lyrically inspired titles—the opening line to the Beatles “For No One” seemed perfectly apt. And hey, let’s here it for February 2014!—this marks four selections for the month, the most of any month in this retrospective. Here’s my runner up to Winter has its ways as second best sunset photo of the year. I dig everything about this picture. The way the blues and pinks work together; the subtle movement to the colors reflected in the bay; the cotton candy clouds drifting the sky; and the foreground marked by knotty boards and one small stone. It’s a minimal composition that I’m definitely proud of. Gear change. Time for a run of flower macros. This is really how I got my start with a camera in 2012. For much of that year I shot macro exclusively, focusing mostly on flowers and bugs. And while I’ve since grown up as a landscape photographer, I still really enjoy making the small world big with macro. In this shot I’ve pulled a lot of personal favorite styles together. 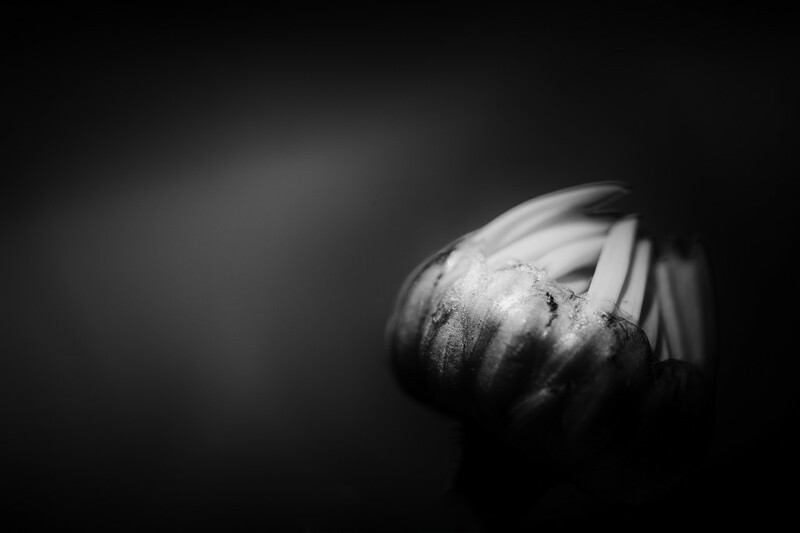 Black and white processing; low key mood; minimalist subject with one yet-to-bloom daisy; and a shallow depth of field. I want the eye to play between the soft grey shadow to the left of the offset daisy bud to the right, highlighted in the glow of an offscreen light source. It’s a simple scene, and that suits my style just fine. 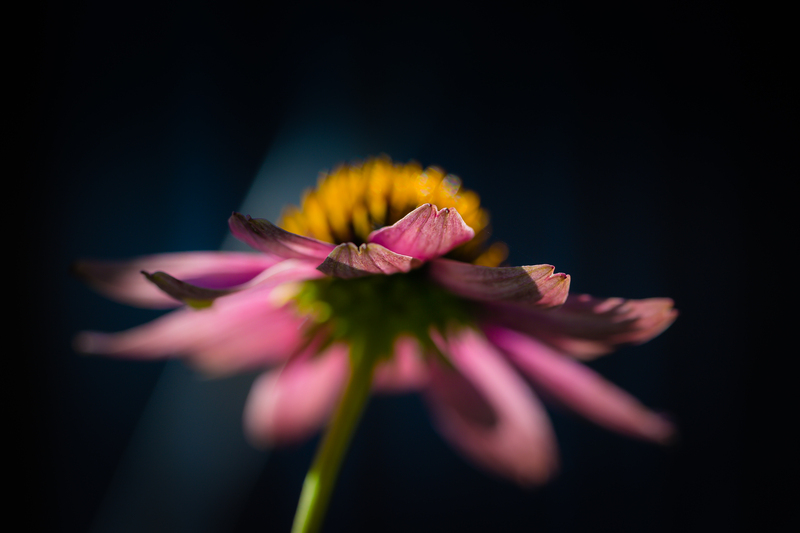 Fact: purple coneflower is one of my all time favorite flowers to photograph. Their size, color, and shape make an ideal macro candidate. This little guy is potted in my backyard, and he was still standing tall into September. Knowing its time was coming I went for the camera. I had about 10 more minutes of afternoon light before the sun would slip behind my house, turning off the light source. Shooting handheld I set my focus to just sharpen the petal tips, letting the rest of the flower fall into soft focus and bokeh. The result? One of my favorite flower macros of the year. Here it is, folks. My number one favorite shot of the year. Starting with a single Klondyke Sunny Red in Ben Wurst’s front yard wildflower bed, I made a handheld macro photograph aiming directly at the flower from its waistline if you will. What struck me staring down the barrel of my viewfinder was how much this beautiful flower made my mind’s eye behold a graceful dancer twirling the most beautiful cocktail dress. 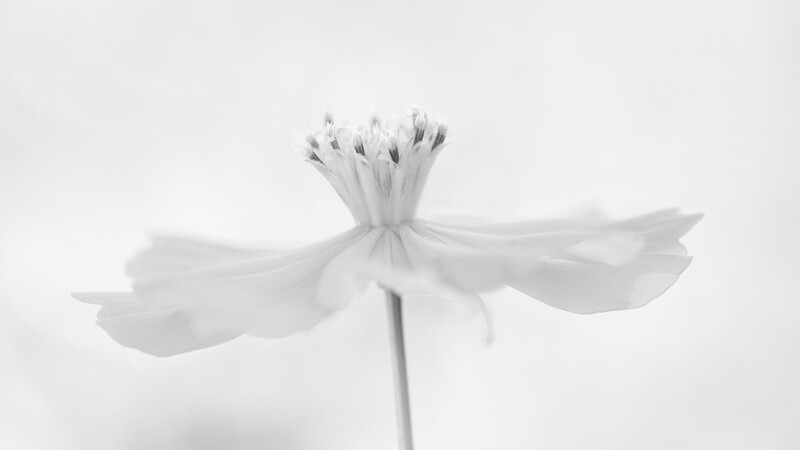 With consideration toward the wonderful femininity inherent in this photograph, I went with a proper high key black and white treatment to accent the softness and sensuality that is this photograph. This shot I made is a total departure from my normal photo M.O. That no doubt is what makes it even more special to me, and why it stands atop my 2014 list. Update: if you’ve got the time please check out Ben Wurst’s best photographs of 2014. 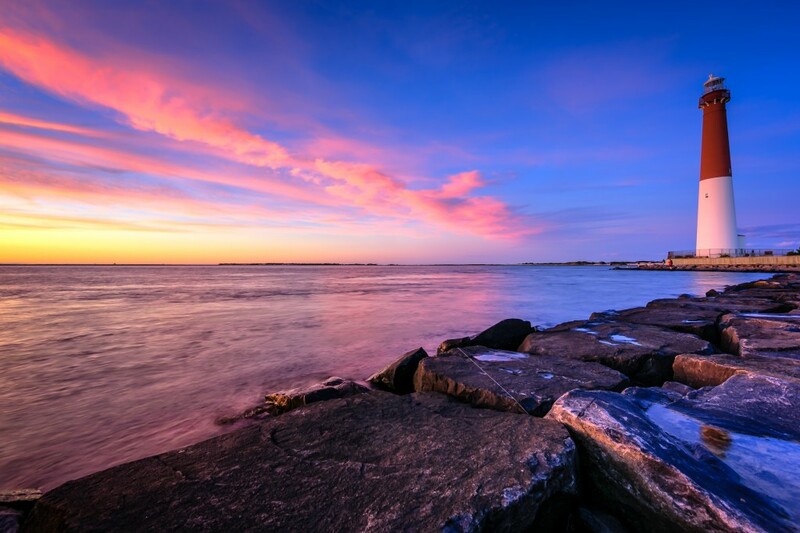 Barnegat Lighthouse, easily the most famous landmark within ~30 miles of my house. I don’t get out there to photograph nearly enough, and this represents one of only three Old Barney shots I’ve posted. 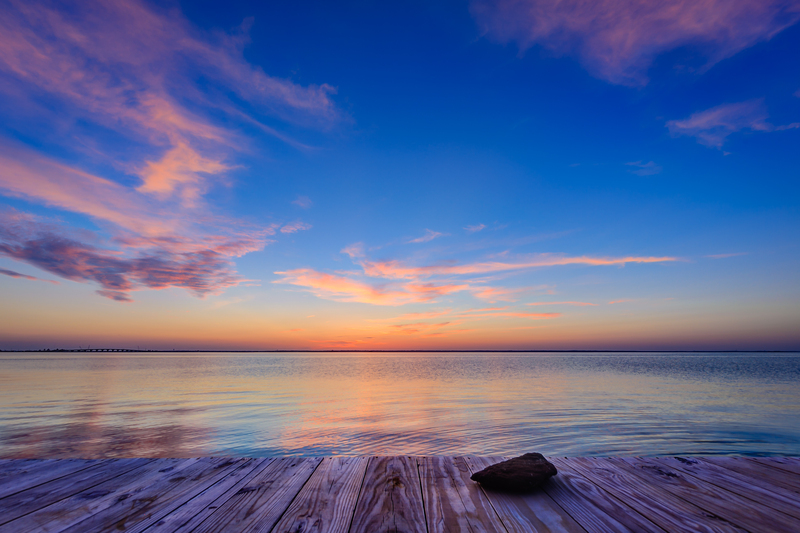 Lucky for me the sunset and subsequent blue hour was jamming on September 22nd. I posted up with my tripod out on the jetty rock figuring it would provide my best vantage point and composition for this time of year. Seconds before I periscoped my tripod head northward to make this shot above, I was panned to my left taking this wonderful sunset. The light was crazy, rendering one of the best skies of the year. Some days you just get lucky. There was a lone piece of jetty rock set about 6 feet away from the main jetty. Between waves I was running up to the rock, dangling my camera about 3 inches from the sand, and trying to time the shutter with water spray firing off said rock. 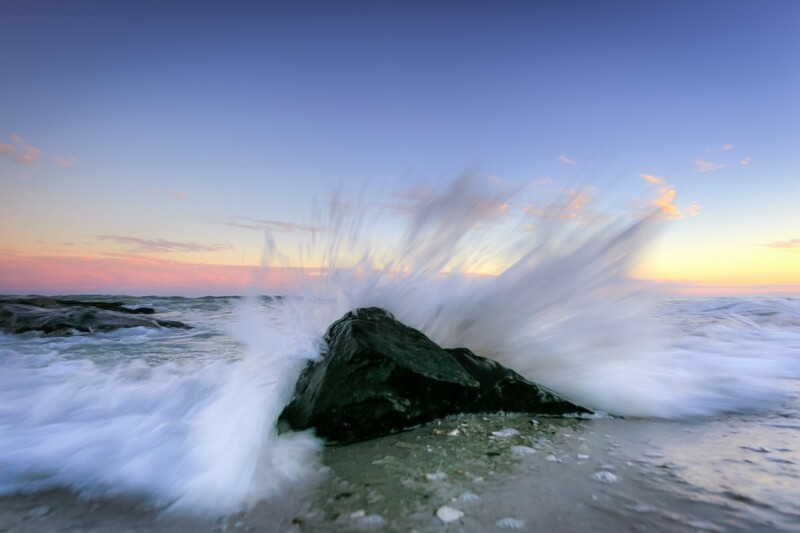 Since I was shooting a mere 15 inches from the jetty rock, the big risk was getting myself and my camera out of there before the spray got to me. All went well, and I got a sweet shot. 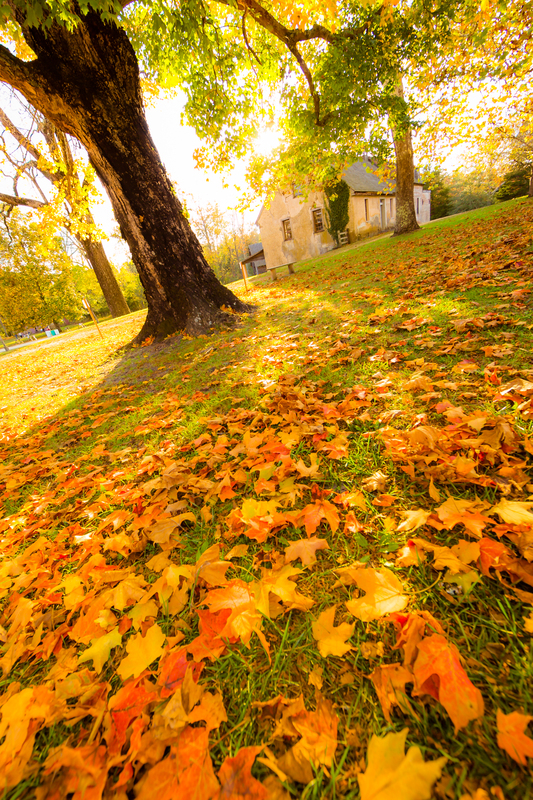 Get thee to Batsto Village in Autumn. Tucked away in Wharton State Forest it’s a wonderful place to visit, capturing an 18th century town frozen in time in the middle of the Pinelands. I was lucky enough to photowalk the grounds with a few friends just as the maples were beginning to fire with all their orange, red, and yellow fury. Juxtaposed with the still green grass washed in late day sun, the place looked great. I made several keepers in just about 90 minutes of shooting, but this one is my personal favorite. It’s fun and it breaks the rules a little bit—with blown out skies, crooked horizon and odd angles. But sometimes breaking the rules is the best course of action in your photo work. That’s it. We made it. Stepping back through the year was tons of fun—far surpassing expectations. I’m already looking forward to doing it again next year. And how about a shout-out for the south Jersey? Every photograph here was taken within 25 miles of my house. If you toss the Batsto shot at the end, that drops down to about 12 miles. So many great spots right in my backyard. Be sure to check out my best of work from 2015 and 2016.